As I've mentioned a few times before, I had been so disappointed with my first Sigma 18-50mm lenses inability to capture sharp images from medium distances out, that I was forced to buy Nikon's 16-85mm f3.5-5.6 zoom to replace it. That purchase turned my Sigma lens into a large nice looking paper weight. However that still left me with a hole in my lens armament. As I brought the all purpose lens so that on occasions when there wasn't enough room to carry both my 105mm micro (a beast of a macro lens) and my main "street photography" lens in any of my smallest bags, the 18-50mm f2.8 could somewhat do the job of both lenses in a pinch, allowing me to keep the 105mm home, and save some space in my bag. And it really was great at taking closeup shots. Just nothing else. Finally, guessing that Sigma bit off more than it could chew with the 18-50mm I traded it in for their 17-70mm f2.8-4.5. Less ambitious, it doesn't have a wide constant aperture of f2.8, nor does it focus close enough to give you 1/2 life size magnification. It stops at 2.7 mag., which is a little less than half life size. But I figured asking it to do less would result in better overall performance, and I was right. As there was no shot that I gave it that it couldn't capture with flying colors. Still since it has less "reach" than my 16-85mm nikkor on the "tele" end, and one less degree on the wide angle end, and on top of that my nikkor is just as sharp and if anything, even sharper, than my 17-70mm Sigma, I only bring it along just as originally intended, on days when there isn't enough room in my bag for 105mm micro too. But today wasn't one of those days. As I was using one of my bigger camera bags and my hulking micro nikkor fit in just fine. But a few days before I had accidentally dropped my new Sigma lens (not realizing it was still in my camera bag) about a foot off the ground onto the cement floor of my basement (just my luck that part of the basement had to have the rug cut up due to the freak flooding in 07' that flooded every one's homes in the tri-state area that spring when it never stopped raining for a week). The big heavy lens hit the floor with a large thud. It was the first time in 20 years I've ever dropped one of my lenses. So I took it out today instead of my 16-85mm to see if it was still alright. Could it still auto focus in a moments notice when I quickly snapped off a shot like this one here with no time to hunt for correct distance? Was it still capable of taking sharp pictures? Was it still smooth and quiet when it auto focused? Yes, yes, and yes. Most of the shots I took this day in the park were taken with this lens. So not only is this particular lens an excellent optical performer, it is also one extremely durable lens to boot. Sigma can really take a bow on this lens, for it is constantly in one of my camera bags on a day I go shooting. 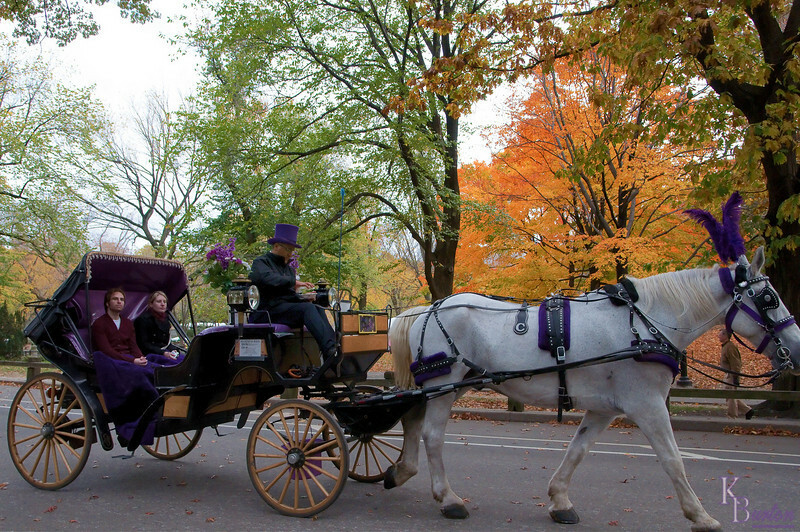 Looks like a lovely carriage ride as the first glimpse of fall color and cooler temps arrives. Very nice shot. I can feel the Fall in the air. Really like this shot; the fall colors are lovely! !